American scientists who shot nearly 1,000 sperm whales with tissue-sampling darts discovered stunningly high levels of toxic and heavy metals in the animals that they say could affect the health of both ocean life and the millions who eat seafood. A report Thursday noted high levels of cadmium, aluminum, chromium, lead, silver, mercury and titanium in the mammals, according to samples taken over five years. Analysis of cells from the sperm whales showed that pollution is reaching the farthest corners of the oceans, from deep in the polar region to "the middle of nowhere" in the equatorial regions, said biologist Roger Payne, founder and president of Ocean Alliance that conducted the research. The whales travel on voyages up to 87,000 miles (140,000 kilometers). "These contaminants, I think, are threatening the human food supply. They certainly are threatening the whales and the other animals that live in the ocean," he said. Ultimately, he said, the metals could contaminate fish, which are a primary source of animal protein for 1 billion people. "This provides new and very important information about the hazards and the problem of these sorts of contaminants in the ocean, both for the whales and their habitat," Medina told hundreds of government officials, marine scientists and environmentalists. Payne, 75, is best known for his 1968 discovery and recordings of songs by humpback whales, and for finding that some whale species can communicate with each other over long distances. The 93-foot (28-meter) ketch "Odyssey" set out in March 2000 from San Diego, California, to document the oceans' health by taking tissue samples from the free-ranging sperm whale, which venture from the poles to the tropics. Like humans, they stand at the top of the marine food chain. By August 2005, it had collected pencil-eraser sized samples from 955 whales using a dart gun that scientists say barely made the animal flinch. The samples were sent for analysis to marine toxicologist John Wise at the University of Southern Maine. DNA was compared to ensure the animals were not tested more than once. The original objective of the voyage was to measure chemicals known as persistent organic pollutants, and the study of metals was an afterthought. The researchers were stunned with the results. "That's where the shocking, sort of draw-dropping concentrations exist," Payne said. Although it was impossible to know where the whales had been, Payne said the contamination was embedded in blubber formed in the frigid polar regions, indicating that the animals had ingested the metals far from where they were emitted. How that happened is unclear, but the contaminants likely were carried by wind or ocean currents. Chromium, a corrosion-resistant material, is used in stainless steel, paints, dyes and the tanning of leather, and can cause lung cancer in people who work in industries where it is commonly used. Wise applied chromium to healthy whale cells in the laboratory to study its effect. He found that the concentration of chromium found in whales was several times higher than the level required to kill healthy cells in a Petri dish, Payne said. Another surprise was aluminum, used in packaging, cooking pots and water treatment, although its effects are unknown. 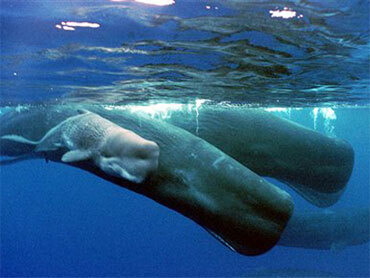 Payne said whales absorb the contaminants and pass them on to the next generation when a female nurses her calf. "What she's actually doing is dumping her lifetime accumulation of that fat-soluble stuff into her baby," he said, and each generation passes on more to the next. The consequences could be horrific for both whale and man, he said. "I don't see any future for whale species except extinction. This not on anybody's radar, no government's radar anywhere, and I think it should be," he said.